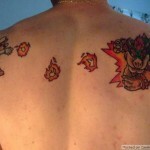 There are some areas I can’t even imagine getting a tattoo due to the sensitivity of the skin and the top of a persons feet is pretty high on that list. 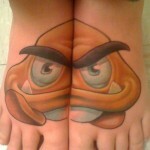 Just the thought of getting my feet inked makes me cringe! 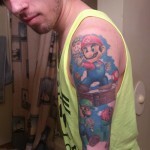 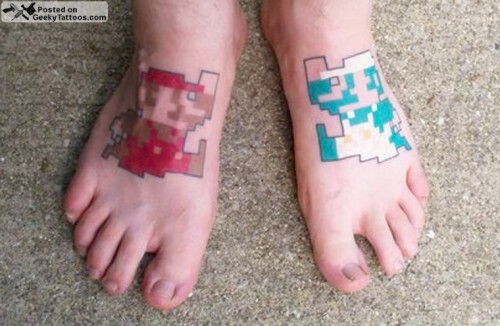 Well, one gamer decided to ignore the pain and get these cool 8-bit Mario and Luigi tattoos on his feet! 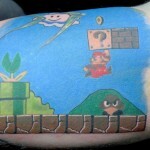 The artist Anthony “Tank” Mansfield (Check out his amazing robot art) got these awesome 8-bit Mario and Luigi tattoos on his feet to celebrate his 30th birthday which marked 25 years since he had his first gaming experience with Super Mario Bros. 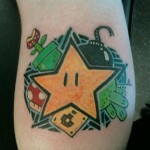 This Super Mario Bros inspired feet tattoos were done by David Boggins at Body Language Tattoo in Columbus, OH.